Medical science has helped countless families conceive when they couldn’t conceive naturally. But much of the technology used in procedures like IVF are relatively new, only existing for about a generation. Such is the case in baby Vivienne’s conception. Richard Pott was in the prime of his life, off at college and just 21 years old, when he learned that he had testicular cancer. His doctors advised him to freeze some of his sperm, just in case he was left infertile from the cancer treatments – a very common side effect. While a standard procedure today, the freezing technology was relatively new at that time, and Richard wasn’t really thinking about a family at the time. 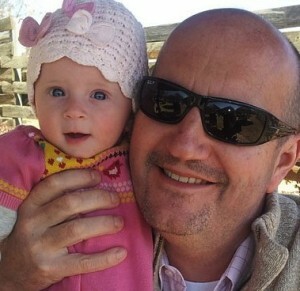 But today, holding his daughter, Vivienne, he is thankful that he took the advice of his doctors. “I really want our story to give hope to other people who are in similar circumstances,” he stated. It was 1999 when he married his wife, Rebecca, in London. Rebecca was diagnosed with endometriosis just four years later and the couple was told to start having children as soon as possible if they wanted them. Taking their doctors advice, Richard and Rebecca embarked on two fresh IVF cycles. Soon after, little Henry was born. The couple was enthralled with their son, but sometime later, they decided that they wanted to have another child. So they decided to try fresh sperm IVF again. This time, they weren’t successful. After four failed fresh IVF attempts, the couple turned to Richard’s frozen sperm, what Rebecca referred to as their ‘rainy day sperm.’ She had travelled to the University College London Hospital to collect the samples and took them by cab across London to Guy’s Hospital. “The cab driver asked me what was in the package and I said ‘my baby.’ He really did not know what to day,” Rebecca said about the transport. After the sperm thawed, five eggs were fertilized, producing five embryos. For their first attempt at using Richard’s frozen sperm, the couple implanted two of the newly created embryos. The remaining three embryos were frozen. But despair soon followed. The embryos didn’t take. “I was so numb, I was out searching for a job because I was so convinced it was not going to work,” Rebecca stated. But the couple decided to give IVF one last try, using the two of the last three frozen embryos, making the couple the first in Britain to try double-frozen sperm/embryos. A few weeks later, the couple discovered that the implant had been a success. The pregnancy proved to be difficult – Rebecca ended up with pre-eclampsia, so Vivienne was born nine weeks early by caesarean at St. George’s Hospital in Tooting, South West, London. She was just 1.1kg at birth and needed to stay in the hospital for seven weeks after her birth, but her parents say that she is nothing short of a miracle. Dr. Tarek El-Toukhy, from the Guy’s and St. Thomas’ Assisted Conception Unit in London helped with the IVF procedure that conceived Vivienne.